ONLY days into the federal election campaign, the race for the seat of Wentworth has been sullied by an offensive email targeting Jewish MP Dr Kerryn Phelps. A NEW cemetery at Varroville in Sydney's south west is "the only viable option" to avoid the Jewish community from running out of burial space in five years. A NEW tax treaty signed late last month between Australia and Israel will "definitely improve cross-border investment and trade opportunities", the head of banking and finance at one of Israel's most prominent law firms says. 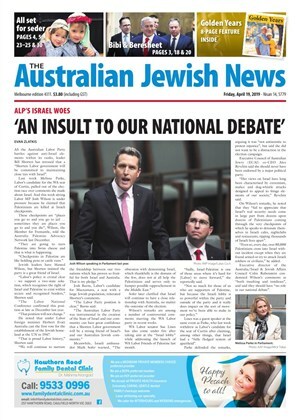 Alon Ben-Gurion, grandson of Israel's founding prime minister, was the keynote speaker at the Jewish National Fund (JNF) NSW AGM in Sydney late last month. MORE than twice as many antisemitic incidents were reported in NSW than Victoria in 2018, according to a new Community Security Group (CSG) analysis. 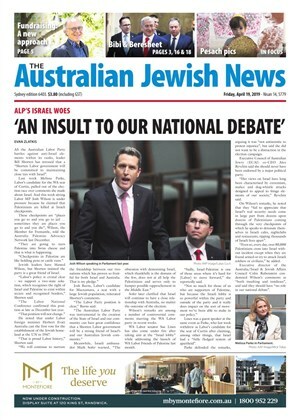 INCOMING Coogee MP Marjorie O'Neill told The AJN this week, "The Jewish community has welcomed me in with open arms."